Is the house where Wolfgang Amadeus Mozart was born on January 27, 1756. On the third floor where young Mozart was living is a museum (mementos, violin of young Mozart, portraits, etc.). On the second floor is an exhibition called "Mozart in the Theater", with illuminated miniature stages. Its dating to 13th century. There are interesting houses, important in medieval time like established in 1591 and Café Tomaselli. In center stands Market Fountain and St Florian's Fountain and grille from Renaissance. Its situated on Pfeifergasse, built in 1305 and much altered in , which was the residence of the Prince Bishops of Chiemsee and is now the seat of the provincial government; it has an arcaded courtyard decorated with coats of arms. It is constructed in Italian Baroque style by Casper Zuccalli, has not tower but a massive dome. In the interior are precious stucco decoration of about 1730. Baroque cathedral from 17th century, famous the Roman Catholic Archdiocese of Salzburg, dedicated to Saint Rupert of Salzburg. It is one of the largest medieval castles in Europe. Is situated on Festungsberg hill. It was used as a prison, in World War I . Now is one of the most interested tourist attraction, with a cable car. Sant Peter's cemetery it's one of the most important tourist attraction in the city, where is placed a catacomb. 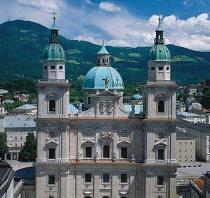 Is one of the most-visited places in Salzburg, bilt in the baroque style. There are situated mythology-themed statues and sculptures from 18th century. Its popular location for weddings. Since many centuries this was place of worship. First a Romanesque church received it's today look in the begin of 18th century. Inside you can admire fresco in cupola. The Tivoli in Salzburg is totally different from the one in Copenhagen. A oasis of tranquility and greenery in middle of city bustle is inviting for at least couple minutes of rest. The mansion hosts today International Graphic Arts Centre, with several sculptures strewned in the park.